With the heat wave finally starting to come to an end here in Southern California, I’m really getting into the swing of fall cooking! One of my family’s favorite dishes is this Crock Pot Chicken and Dumplings Recipe. It is SO ridiculously delicious and SO filling and satisfying. You can feel free to experiment and add other veggies if you’d like. Sometimes, I make it without the potatoes, and that shaves an extra Point off. But those moist, thick, fluffy dumplings are just heavenly, and are the true star of this popular comfort food recipe. Perfect for a chilly day, this tasty Crock Pot Chicken and Dumplings is sure to become a family favorite of yours too! Enjoy. 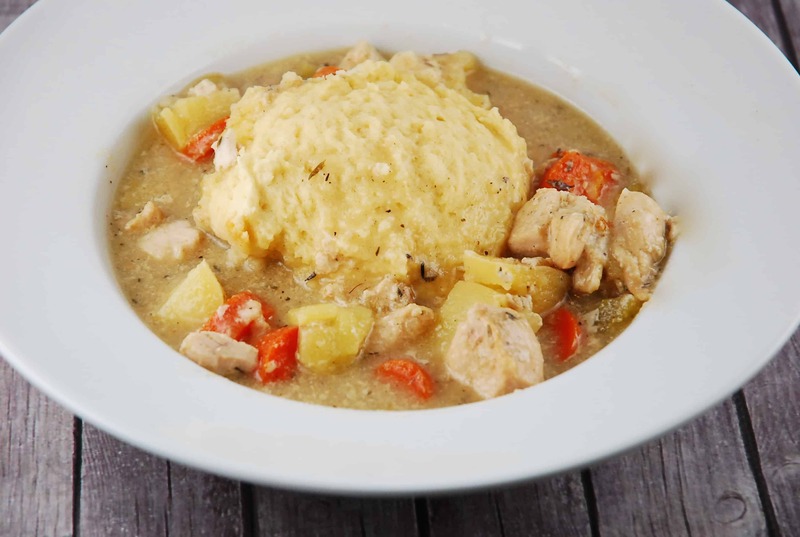 Hearty, incredibly filling, and absolutely delicious, this Weight Watchers Chicken and Dumplings dish is the ultimate in guilt free comfort food! Perfect for a chilly autumn or winter’s day. Place the chicken, potatoes, carrots, celery and bouillon cube in a slow cooker. Season with black pepper. In a medium sized bowl, combine cream of chicken soup, broth, onion powder, and dried thyme. Pour mixture over the chicken and vegetables. Cover and cook on low for about 6 hours, or until chicken is fully cooked. In a large bowl, mix together the baking mix and milk. Spoon the batter into 6 blobs on top of the chicken mixture. Turn the heat up to high, and cover, but tilt the lid to vent the steam. Cook for about 30-40 minutes, or until the dumplings are cooked through and no longer wet in the middle (you can test by piercing with a toothpick). I need to make this dairy-free. I can substitute almond or coconut milk for the milk, but what would you recommend instead of the soup? Thanks! You almost had me with this recipe until you added a CAN of soup. I am making this right now & my house smells AMAZING! Even my husband…who is very picky, would rather have beef than chicken, not usually thrilled about lower fat, healthier meals…says it smells SO GOOD and he is excited to eat it! What a great, easy recipe, thank you! Fabulous! I have made this twice now and have been wowed each time. Thanks! This is SO GOOD. Everthing turned out perfectly, I followed the recipe exactly. Will absolutely be making this again! Thank you! Hi, I was confused also since I couldn’t find the Pinterest button. But I found that just by poking the picture somewhere in the bottom left corner of the picture that the Pinterest button appears and then you can push it. I’m also wanting to know what the actual serving size is – one cup? 1.5 cups? It’s hard to divide by 6 with a soupy mix in a crockpot…I have this cooking as we speak! It’s hard to say exactly…since the size of the vegetable pieces can vary and will affect how much you can fit into a cup. I’d estimate that each serving of the soup is about 1 1/4 cups. Hi I made your recipe yesterday but I had to throw out the whole thing it would have been great without the thyme that ruined it also the chicken boubillon cube did too because it made it come out too salty I’m going to make it today without the thyme! Completely agree! Made this yesterday and there was WAYY too much thyme. I would recommend adding just half a tsp if that. Didn’t throw it out but I’m disappointed. ): Maybe the leftovers will be better! Do you add the dumpling mix after the 6h 30min crockpot cook time (high or medium setting? ), or at the start? You add the dumplings in after cooking on low for 6 hours. Then after you put the dumplings in, turn the heat up to high and cook for 30 minutes. This looks great and I’ll be making this weekend. If I didn’t include the biscuits how many points would I take off? Also, what is the size of a serving? I love your recipes and they are great with following WW. Thank you in advance!